be quiet! is justifiably famous for making some of the most technologically advanced, and absolutely the quietest, PC equipment available. 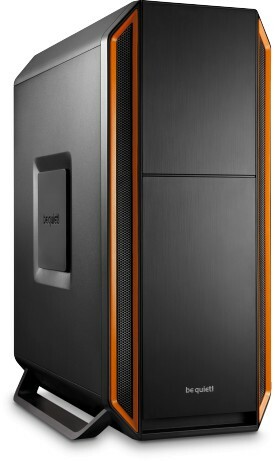 True to the motto “form follows function” the PC case Silent Base 800 Window Orange offers the perfect symbiosis of noise prevention and cooling performance, a good usability and an extensive capacity for high-end hardware. 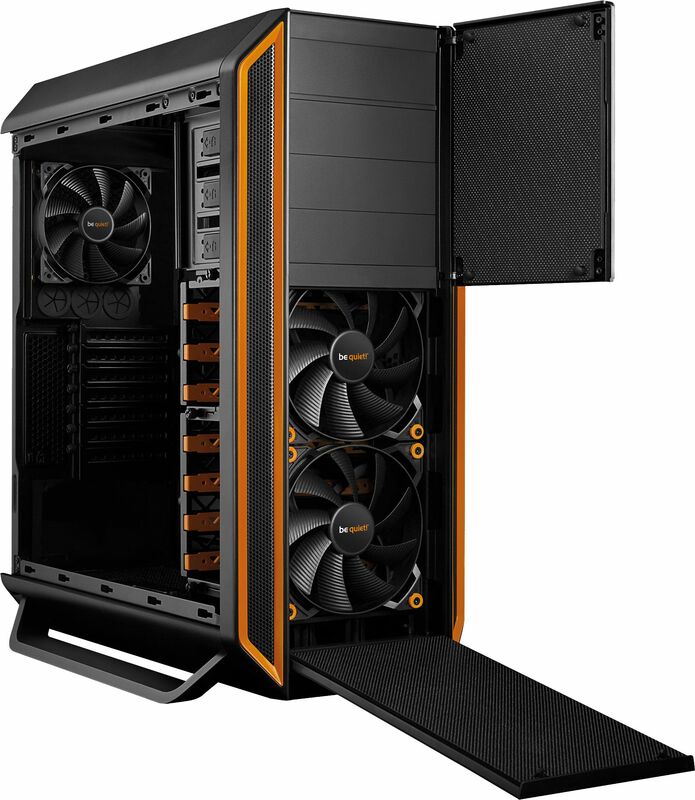 The innovative construction of the side, bottom and top covers optimises case airflow for perfect air circulation, reducing turbulence and generating superior cooling at lower fan speeds for exceedingly quiet operation. Sound insulation material on the side panel and the front also reduces vibrations and provides even more stability. The side panel with an innovative double-glazed window and a cavity of 9mm between the panes of the window provides superb sound insulation. Three pre-installed Pure Wings 2 fans ( two Pure Wings 2 140mm in the front, and one Pure Wings 2 120mm at the rear) include an array of optimisations for quiet airflow, unique airflow-optimised fan blade design reduces noise-generating fan turbulence, high-quality sleeved bearing, switching, noise-cancelling circuitry and the fans are decoupled from the case with special mounts, reducing transmission of vibration and noise. Hard drive cages feature unique, specially designed silicone rubber anti-vibration rails that fully decouple drives so as to eliminate any transmission of vibration to the case. The side panel with an innovative double-glazed window and a cavity of 9mm between the panes of the window provides superb sound insulation - Windowed version only. The upper and lower cover air ducts are designed both to channel cooling airflow. The rear opening allows air to enter the chassis while reducing the noise passing through the front panel. 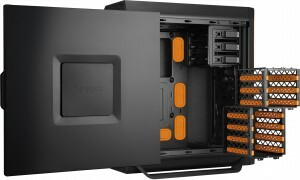 Adjustable side panel vent allows the user to fine tune airflow. Additional fan mounting of up to three fans at the top and the bottom. 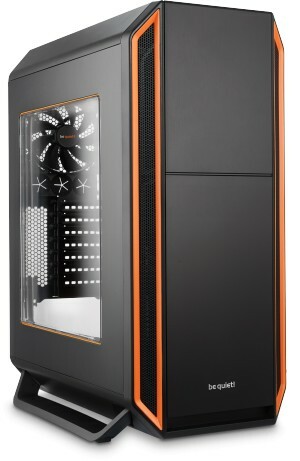 Water cooling ready for high-performance systems. 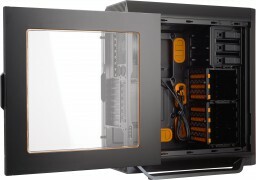 Three areas are provided for radiators: below the top cover, in the HDD section, and in the rear of the case. Organised cable routing assures a better look, but more importantly it also provides for efficient airflow, better cooling, and therefore quieter operation. 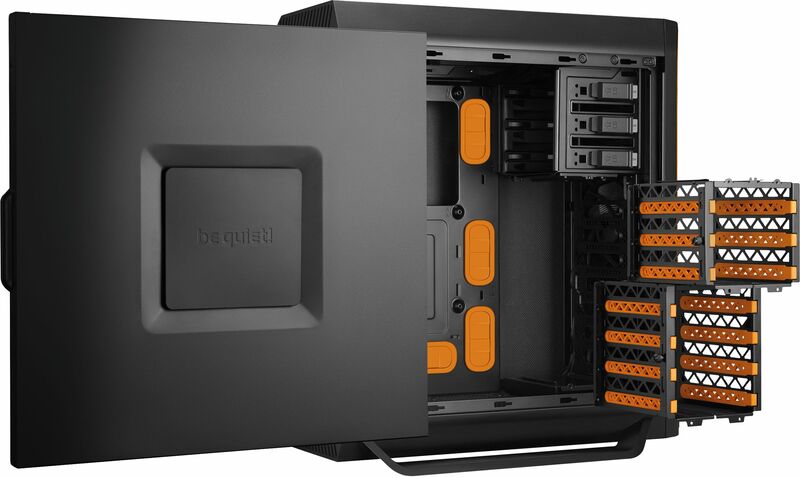 The unique, specially designed front panel intake system allows cool air to enter the case while greatly eliminating almost all of the noise that is allowed back out. The top and bottom covers channel cooling air into the case and allow hot air to exit the top while greatly reducing the noise that is allowed to escape the case. 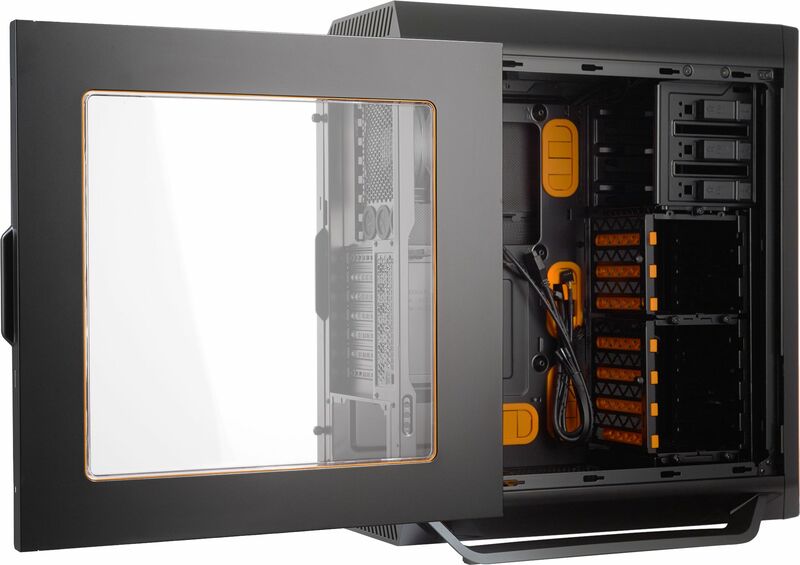 The chassis is fitted with a side panel that offers more internal space, allowing use of high-end hardware and cooler such as the Dark Rock series. 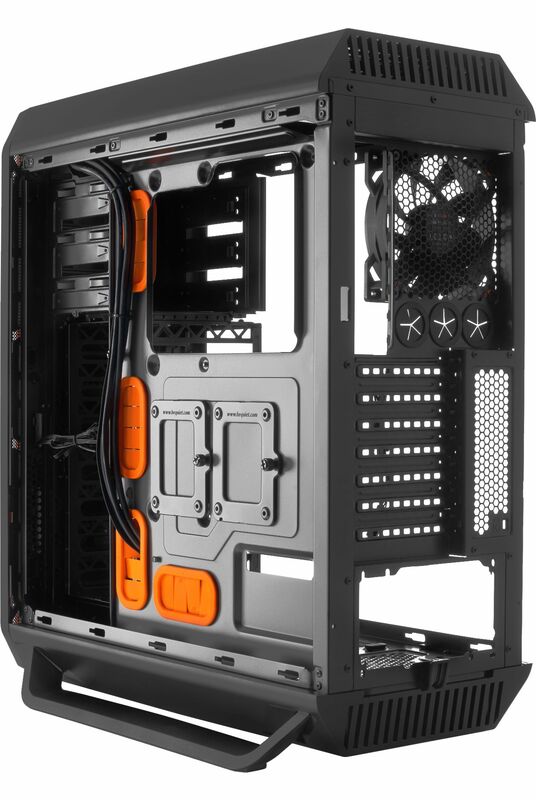 The U-shaped edges on the side panels reduce vibration and improve case stability. The side panel vent can be closed for silent operation, open or partially open in different amounts for increased air intake. The side panel window is made from scratch and impact resisting material and offers superb sound insulation due to the double-glazing of the window. The drive cages can be re-arranged to fit different hardware setups. All relevant openings are protected with removable, cleanable filters to keep your system clean of heat-trapping dust. Generous space and flexibility supports all manner of high-end hardware. Thoughtful design supports professional cable management: Innovative side panel design provides more space for cable management behind the M/B tray and silicone rubber grommets on the M/B tray hold cables from shifting. Motherboard tray is provided with large, convenient cut-outs for CPU cooler back plates that will ensure compatibility with current and future CPU sockets. Tool-less drive mounting allows drive configuration and reconfiguration in minutes: Tool-less mounting system for 5.25” drives like ODD, fan controllers etc, silicone rubber rails allow fast and secure tool-less 3.5” HDD mounts, case can fit four 2.5” SSD, one mounting bay is in each 3.5" HDD cage and two additional mounting bays behind the M/B tray. Easy to remove dust filters are user-friendly and easy to clean.